The goal is simple: To give new lawyers the skills they need to provide more value. Swimming Lessons for Baby Sharks® presentations provide useful, practical advice to give law students and new lawyers an important head start. The programs provide practical tips that participants can use right away as well as key habits for long-term success. An entertaining and dynamic speaker, Grover is a former partner at Foster Pepper PLLC, one of the Northwest’s largest law firms. Grover is a sought-after speaker on career success for law students and new lawyers. He is a frequent presenter at major law firms nationwide and law schools of all sizes, including Harvard. Grover also speaks at numerous national law career conferences, including, NALP and PDC, Ms. JD, and American Bar Association conferences. Swimming Lessons for Baby Sharks® presentations are tailored to meet specific needs. But every presentation focuses on helping new lawyers provide value. Interaction and real-life lessons make learning efficient and effective. With a friendly competition and continuous interaction, this program empowers summer associates to navigate the summer with finesse: What if you can’t meet a deadline before you have to be at a dinner with partners? What if you cite the wrong statute – and discover it two days later? And do you order the expensive liquor if an associate says it’s okay? With these and other engaging scenarios – customized for each firm – teams gain points for identifying next steps to build and maintain a positive reputation. With beautiful graphics and interactive elements designed by a professional designer and filmmaker, the program provides a warm welcome and demystifies potentially stressful situations. Interactive elements include text polling, role play, “Family Feud” answer reveals, videos and more. With a light, but practical approach, Best Day, Best Summer helps summer associates shine. And that helps everyone have a better summer. For the end of the summer, Catapult Your Career in Your 3L Year engages summer associates with a habit-tracking app that keeps them connected to each other and to the firm. Recruits continue to build key habits during their last year in school, giving them a head start when they return. Kick off orientation with a special welcome for new lawyers and learning that doesn’t seem like learning. 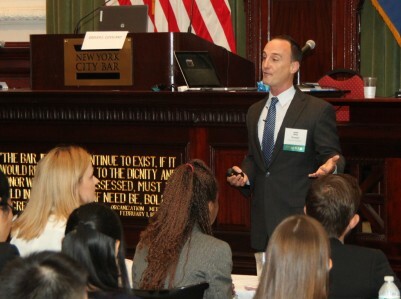 Engaging, interactive workshops arm new lawyers with actionable advice to help them start strong. These customized programs are carefully tailored to complement your other offerings. Exploring partner expectations and generational differences, this workshop gives associates the knowledge and security of understanding how to interact with partners. Associates learn how to meet – and exceed – expectations. And associates understand how they benefit when partners can sleep at night. Focusing on strategies to help associates capture time and complete projects efficiently, associates learn to tame time. Deadline met. Time recorded. Everyone wins. This program gives associates a toolkit of strategies to up their communications game. From e-mails to executive presence, associates learn to communicate to build trust and instill confidence. Associates know they need to expand their professional networks, but on top of everything else, business development can seem daunting and uncomfortable. This program helps turn networking into a habit and aligns strategies with individual strengths. With employers clamoring for “practice-ready” graduates, Swimming Lessons for Baby Sharks® Law School Programs give students’ professionalism and job search skills a boost. The engaging workshops are customized to highlight and complement career service offerings. Backed by research, All Together Now is an engaging and entertaining program to facilitate understanding and seamless work among the four generations at law firms. Perfect for a firm retreat, these no-fluff programs provide key insights and strategies to reduce frustration and increase productivity. The programs address differing communications styles, proven strategies for giving and receiving feedback, and tips to help all of the generations work in concert with a common purpose.